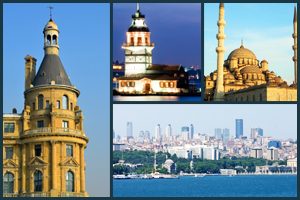 Located strategically along the Silk Road, Istanbul is the largest city of Turkey. With its roots deep in the pages of a rich history, Istanbul is now truly a transcontinental city with one part of the population living in Asia and the economic and historical centers in Europe. Its strategic location at the junction of international land and sea trade routes makes Istanbul the hub of the economy of Turkey. Also known as the “Gateway to Asia”, Istanbul is also a famous tourist location. Each year millions of tourists flock to this great city to bathe in its rich heritage and culture. The palaces and monuments are a living testimony to the works of its different rulers. In 2010, it was named as the European Capital of Culture. This resulted in increased tourist inflow, making it the tenth-most popular tourist destination. Shopping in this city will give you a feeling of moving through time as the antique markets coexist in harmony with the modern shops. The recorded history of Istanbul dates back to about 660 B.C., although recent excavations show remnants dating back to the seventh millennium B.C. Istanbul’s history can be broadly divided into two eras—Byzantine and Ottoman and Turkish. Constantine I became the Roman emperor after defeating Licinius in 324. He created a new city called Constantinople (as Istanbul was then known) and made it the eastern capital of the empire. On May 11, 330 Constantinople came to be known as the capital of the Byzantine Empire. A number of churches was built inside the city, the most famous being the Hagia Sofia, which remained as the largest cathedral for a thousand years. Constantinople was the largest and richest city in Europe during the Middle Ages but its position started declining after the fourth crusade. On 29 May 1453, Sultan Mehmed II occupied Constantinople and the city became the new capital and administrative hub of the Ottoman Empire. Mehmed II changed the name of the city to Istanbul. The Ottomans transformed the city from a Christian citadel to an Islamic center of culture. During this period a number of the city’s attractions were built, especially during the reign of Suleiman the Magnificent (1520-1566). On October 29, 1923, the Treaty of Lausanne was signed marking the birth of the Republic of Turkey, bringing down the curtains on the Ottoman Empire. The best time to visit Istanbul is spring, i.e., from April to mid June. Although it might rain a bit during April, the days are long and the tourist season has not quite begun. The time from mid September to October is also good for visiting Istanbul. The weather is mostly mild but the days become shorter. If you are an art enthusiast, then you will have to brave the Turkish summer. A number of art festivals and music events take place during the summer months. Carry an extra amount of cash if you plan to visit Istanbul during the five-day Kurban Bayramı. The banks remain closed during that period and the ATMs tend to run out of money. Istanbul can be reached by all three types of transport—air, land, and sea. Air: The Ataturk International Airport is the main airport of Istanbul. Approximately 700 planes use this airport every day. Almost all the major airlines operate out of this airport. The airport has a 24-hour Tourist Information Office where you will find brochures, and executives to help you with your queries. You will also find car-hire desks, exchange offices, a pharmacy, and ATMs. The Sabiha Gokcen Airport serves as the second airport of Istanbul. Boat: If you are traveling from Europe you have the option of reaching Istanbul in a cruise ship. The Karakoy International Maritime Passenger Terminal, located near the Galata Bridge, is where the cruise ships arrive. The Tanah Merah Ferry Terminal and Changi Ferry Terminal have boat services to Indonesia and Malaysia respectively. In addition to that you can charter boats or avail ferries to visit the neighboring islands. Land: You can reach Istanbul by train both from Europe and Asia. Trains coming from Europe terminate at the Sirkeci Railway Station while those traveling from Asia and the east and north arrive at the Haydarpasa Railway Station. The International Istanbul Bus Station is the city’s main bus station for both intercity and international routes. Moving in the city: There is no dearth of choices for traveling inside Istanbul. You can avail bus, tram, tourist buses, metros, suburban trains, cable cars, cars, motorcycles, taxis, and bicycles. You can also get around Istanbul by taking a ferry or sea bus. Blue Mosque (Sultan Ahmet Camii): The Sultan Ahmet Camii, also known as the Blue Mosque, was built in 1609 as a rival to the famous Hagia Sofia. The mosque is famous for its magnificent tiered domes and six minarets which are visible from afar. The interior of the mosque is beautifully decorated with flower patterns in the Ottoman style. Thousands of blue and white Iznik tiles were used to create these patterns, which gave the mosque its name. There are 260 stained windows throughout the mosque. Every day thousands of worshippers throng the Sultan Ahmet Camii or Blue Mosque to offer their prayers. There is a Carpet and Kilim Museum exhibiting antiques from all over Turkey at the back of the mosque. Entry to the church is free but you have to pay a fee to visit the museum. Hagia Sophia: The Hagia Sophia was commissioned as a cathedral in the 6th century AD. Its enormous size, breathtaking architecture, splendid mosaics and frescoes and huge ochre-colored dome makes it one of the most popular tourist destinations in Istanbul. After Mehmet II became the ruler of Istanbul, he converted it onto a mosque and added minarets and fountains to it. The interior of the Hagia Sophia showcases the best of Christian and Muslim artistry, which includes Byzantine mosaics, icons, and marble columns, a mihrab, and Islamic calligraphy inscriptions on the dome. Entry fee is 15 YTL. Dolmabahce Palace: The Dolmabahce Palace was the second palace of the Ottoman Sultans. It was built by Abdulmecid at the site where Mahmud II’s palace stood. The clock tower, mosque, and palace were completed by the Balyan family of architects in 1853. The interior of the palace boasts of a chandelier, a gift to the Sultan from Queen Victoria. It weighs around 4.5 tons and is the largest in the world. The Dolmabahce Palace once served as the Sultan’s harem. Grand Bazaar (Kapali Carsi): The Grand Bazaar is the biggest and oldest covered bazaar in the world. There are around 4000 shops spread in around 65 twisting streets leading to the central avenue. The Sandal Bedesten (cloth auction) and Cevahir Bedesten (jewelry market) are the two oldest sections of the Grand Bazaar. The streets are named after the items sold in each of these. You will find everything of touristy value here – hand-painted ceramics, carpets and jewelry, meerschaum pipes, spices, textiles, and clothing. Galata Tower: The Galata Tower offers a 360 degree panoramic view of the old part of Istanbul. It is a medieval stone tower and was built in the 14th century in the Galata district of Istanbul. Its high, cone-shaped dominates the skyline, making it one of the most striking landmarks of Istanbul. Today you can enjoy a lavish spread at its resident restaurant and shake a leg with the belly dancers performing in the Galata Tower nightclub. Turkish and Islamic Art Museum: The Turkish and Islamic Art Museum is located in the 16th century palace of the Sultan Grand Vizier, Ibrahim Pasa. The museum displays around 40,000 items of Selcuk, Mamluk, and Ottoman Turkish art. This includes Koran cases, calligraphy, illuminated manuscripts, metalwork, ceramics, and textiles. Its antique carpet exhibit is one of the richest and oldest in the world, containing carpets, kilims, and prayer rugs amongst other items. Entry fee is 10 YTL. Hippodrome: Only a few columns and arches still stand of the magnificent Hippodrome built between 200 and 300 AD. A beautiful public park now stands at this site. Some of the popular landmarks within the park are the Basilica Cistern, Obelisk of Tutmosis III, the Fountain of Wilhelm II, and the Serpentine and Constantine Columns. You can also check your emails or talk to your loved ones while enjoying the lush greenery as the park offers free wireless Internet. Topkapi Palace Museum: The Topkapi Palace was built by Mehmet as a Sultan’s palace. The palace complex consists of a collection of buildings arranged around several courtyards. It is located on the seven hills of Istanbul and provides an uninterrupted view of the Bosphorus River. It also had a harem, which is said have housed 300 women, including the wives, concubines, and children of Mehmet. You can see their living quarters, the royal bedchamber, and the Imperial Hall. The Treasury is home to one of the greatest collection of treasure in the world. Nightlife: Istanbul offers an astonishing variety of options when it comes to its nightlife. You may want to choose from wine bars, jazz joints, hip rooftop, and nightclubs, to name a few. The tourist areas in Sultanmet and Ortakoy have some of the most happening nightclubs. You can start your evening at the many meyhanes—a type of Turkish tavern famous for raki and mezze platters. The clubs and bars operate into the wee hours of the morning and prices are reasonable compared to European cities. If you plan to visit a strip joint or belly dancing club, it is wise to the price beforehand. Shopping: Istanbul offers you a unique mix of the traditional and the modern when it comes to shopping. You will find jewelry, leatherwear, and carpets among other merchandise in the Nuruosmaniye Gate side of the Grand Bazaar. If you are interested in buying antiques then Cukurcuma, Horhor, and Sisli are the places to visit. Nisantasi and Tesvikiye houses world famous boutiques and brands. In addition to that, there are shopping malls and elegant stores throughout the city. So if shopping is on your agenda, then Istanbul will ensure you remain spoilt for choice. Day Trips: While in Istanbul, you can also visit the neighboring sites and attractions. There are numerous tour operators who arrange these trips. Some of the places which you can visit and return the same day include Ephesus, Cappadocia, Pamukkale, Gallipoli, Iznik, Nicea, Bursa and mouth of Black Sea. You can also cruise the Bosphorus River drinking in the sights on both sides of its banks.